Windows (Vista/7/8/10), Mac OS X (10.7.3 or higher) users, and Raspberry Pi users can install the Energy2D app using the installers — Java installation is no longer required to run the app on those two operating systems. Users of Linux, old Windows (2000/XP), or old Mac OS X (lower than 10.7.3) still must install Java before installing the Energy2D app and must use the JNLP Installer (i.e., the Linux Installer). The Zip Installer (i.e., the Raspberry Pi installer) is provided as a fallback option in case all of the above installers fail. Some users requested a version with a high-resolution grid other than the default 100×100. At this point, we haven't provided the ability to adjust this within the software. As a workaround, we are providing a pre-compiled version with a grid of 500×500. Note that this would slow down a simulation for 25 times. And some fluid dynamics simulations may yield different results. However, if you are only concerned with thermal conduction, the results should be fine. This version is provided as a jar file. To run it, you must install Java on your computer first and then double-click on the jar file to launch it. 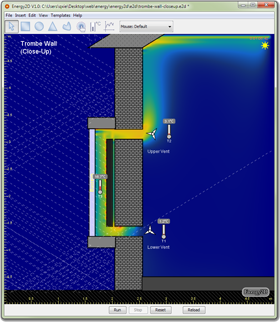 This way you can embed any simulation from our website in your web pages. Check out two embedded applets in a blog post. An advantage of embedding existing simulations from our website in your HTML files is that they can be run locally — you do not have to put your HTML files on a server (they will still work if you put them on a server, of course). Here is an example HTML file that you can download and modify for your own use. 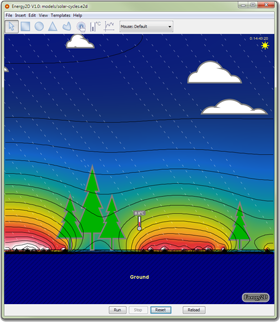 yourmodel.e2d is an Energy2D simulation you create and name using the desktop app. You can download a sample .e2d file from here and use it to test your applet. You can arbitrarily adjust the width and height parameters in the above code to set the size of the applet window. Energy2D will rescale to any size you set. For the Energy2D applet to work, your school's computer networks must allow energy-applet.jar and *.e2d files to go through your firewalls or antivirus systems. You can download the Java source code of Energy2D from Github. Although Energy2D is licensed to you under the MIT License, the license does not extend to the simulations you have created. Just like you own a document you wrote using Microsoft's Word, you own a simulation you designed using Energy2D. So feel free to distribute your simulations in the way you need.